Who Funded Gov. Whitmer’s Inauguration? Gov. Whitmer’s Transition Organization Released A List Of Inauguration Sponsors. Many Of The State’s Largest Interest Groups And Lobbying Firms Were Included. LANSING (Feb. 11, 2019) — The state’s dominant electric utilities and multi-client lobbying firms were among the top sponsors of Gov. Gretchen Whitmer’s inauguration. Whitmer’s transition team voluntarily released a list of inauguration sponsors. The list included 182 groups, businesses or individuals who fell into sponsorship categories ranging from $100,000 to $1,000. Some of the groups on the list supported Whitmer’s opponent, Attorney General Bill Schuette, in the 2018 election, and many of them will be working with state government on upcoming policy decisions. 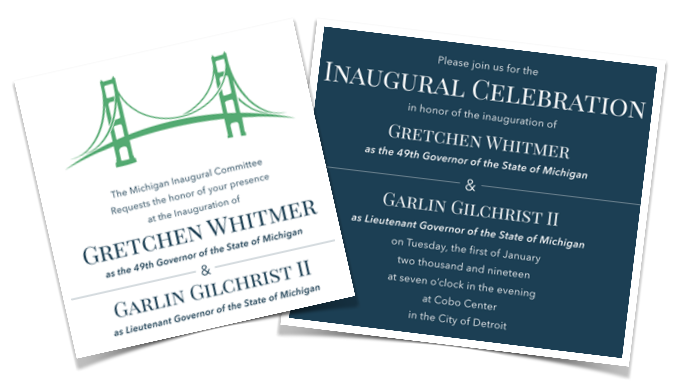 The inauguration festivities took place on Jan. 1, 2019, with a ceremony in Lansing, where Whitmer took the oath of office, and with a celebration later that evening in Detroit. 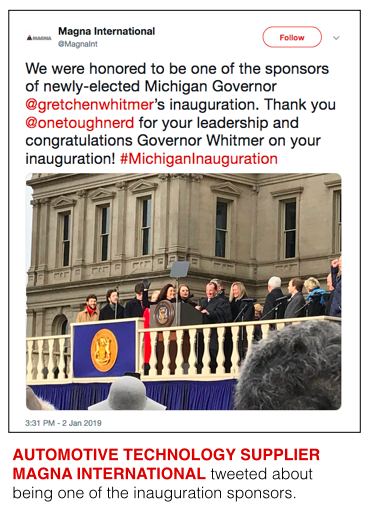 Whitmer’s supporters collected funding for the inauguration events through an organization called Michigan Transition 2019, according to disclosures. An attorney filed documents to incorporate a social welfare nonprofit organization by that name on Nov. 5, according to state business records. Whitmer, a Democrat, defeated Schuette on Nov. 6. It’s not unusual for newly elected officeholders to attract large contributions for inaugural events. At the national level, President Donald Trump’s 2017 inaugural committee raised more than $100 million, according to its filings. The top sponsorship category for the Whitmer inauguration was for those who gave $100,000, according to the transition organization. They were listed as “Mighty Mac Sponsors.” Michigan’s dominant electric utilities, DTE Energy and Consumers Energy, were both listed in the $100,000 sponsorship category. Three of the state’s largest multi-client lobbying firms were also listed in the $100,000 category. They were Governmental Consultant Services Inc., Muchmore Harrington Smalley & Associates and Public Affairs Associates. Many other lobbying firms appeared in other sponsorship categories, and they were able to have their names appear on the sponsorship lists by getting clients to donate. Some of the sponsors of the inaugural organization supported Whitmer’s opponent in the general election race for governor. The Michigan Realtors PAC backed Schuette’s campaign. The Michigan Realtors were also listed at the $50,000 sponsorship level for the Whitmer inaugural organization. Likewise, the Business Leaders for Michigan PAC endorsed Schuette in the race for governor. But the organization was listed in the $25,000 sponsorship category for the Whitmer inauguration. Of the 182 donors, a few disclosed making their contributions to the transition organization through political action committees (PACs). For instance, the PAC of law firm Miller Canfield reported giving $10,000 on Dec. 10, 2018, and Plumbers and Pipefitters Local 333 PAC reported giving $10,000 on Nov. 20, 2018. According to the information from the transition organization, 17 donors were listed in the $100,000-sponsorship category. They were the following: Mr. & Mrs. Ahmed S. Boomrod GDI Services; Blue Cross Blue Shield of Michigan; Consumers Energy; Dow; DTE Energy; Governmental Consultant Services, Inc.; Health Care Association of Michigan; International Brotherhood of Teamsters; International Union, UAW; MGM Grand Detroit; Michigan Education Association; Michigan Laborers' Union; Michigan Regional Council of Carpenters and Millwrights; Muchmore Harrington Smalley & Associates; Operating Engineers 324; Public Affairs Associates; and Mike Shehadi and Shadia Turfah, PharmaScript of Michigan. The donors listed in the $50,000-sponsorship category were the following: Chemical Bank; Delta Dental of Michigan; Honigman; Mr. and Dr. Huizenga (no first names given); Sharif Hussein and Pascale Eid; Ilitch Holdings, Inc.; Kandler Reed Khoury & Muchmore; Karoub Associates; Kelley Cawthorne; McAlvey Merchant & Associates; Meijer, Inc.; Michigan Credit Union League & Affiliates; Michigan Legislative Consultants; Michigan Realtors; Quicken Loans and the Family of Companies; and United Food & Commercial Workers Locals 951 and 876. The donors listed in the $25,000-sponsorship category were the following: AECOM; Boji Group; Business Leaders of Michigan; Citizens Insurance; Clark Hill; Comcast; Dewpoint; Ford Motor Company; Friends of Michigan Recycling; HNTB Corporation; Huntington Bank; ITC: a Fortis Company; LeadingAge Michigan; Magna International; Michigan Association of Broadcasters-Michigan Public Broadcasting; Michigan Association of CPAs; Michigan Beer & Wine Wholesalers Association; Michigan Health & Hospital Association; Michigan Nurses Association; Michigan Paving & Materials and Stoneco of Michigan; National Association of Theater Owners of Michigan; Pfizer; Planned Parenthood of Michigan & Planned Parenthood Advocates of Michigan; UnitedHealth Group; and Weedmaps. The donors listed in the $10,000-sponsorship category were the following: American Federation of Teachers Michigan; Ascend Michigan; Atheneum Hotel; Auto Dealers of Michigan,; Butzel Long; Capitol Relations/Meridian Health Plan A Wellcare Company; Centene; Christman Company; Cinnaire; Coca-Cola Company Michigan; Michael and Lisa Cotton; Dean Transportation; Deloitte; Delta Air Lines, Inc.; Detroit Medical Center; Dickinson Wright PLLC; Eric DiMartino, DC; DLZ Michigan, Inc.; Sarah and Tony Earley; Eidex; Ernst and Young; FCA US; Fritz Enterprises Inc. & Huron Valley Steel Corporation; HTC Global Services; General Motors; IGT Global Solutions Corporation; Jackson National Life Insurance Company; Kalasho Family; Kalitta Air; Karmanos Cancer Institute; The Kroger Co. of Michigan; Kyyba; LightSpeed Communications; Kevin McKinney; Meredith Corporation; Michigan League of Conservation Voters; Michigan AFL-CIO; Michigan AFSCME Council 25, AFL-CIO; Michigan Association for Justice; Michigan Association of Health Plans; Michigan Corrections Organization; Michigan Funeral Directors Association; Michigan Interactive, An NIC Company; Michigan Professional Firefighters Union; Michigan Restaurant & Lodging Association; Michigan State Medical Society; Microsoft; Midland Cogeneration Venture; Midwest Independent Retailers Association; Miller Canfield; Netlogx; Penske Corporation; PhRMA; Pipefitters Local 636; POET LLC; Gui Ponce de Leon; Priority Health; Rehmann; RNDC of Michigan; The Sault Tribe of Chippewa Indians; SEIU Healthcare Michigan; SEIU Local 1; SEIU Local 517M; Shelborne Development; Sun Valley Foods; Philip W. and T. Ardele Shaltz; Small Business Association of Michigan; Switch; TILT Holdings; TransCanada; Uniprop; United Association of Plumbers and Pipefitters Local Union 333 Lansing; and Verizon. Other donors gave in sponsorship categories ranging from $1,000 to $5,000. ARTICLE Who Funded Schuette And Whitmer’s Campaigns For Governor?